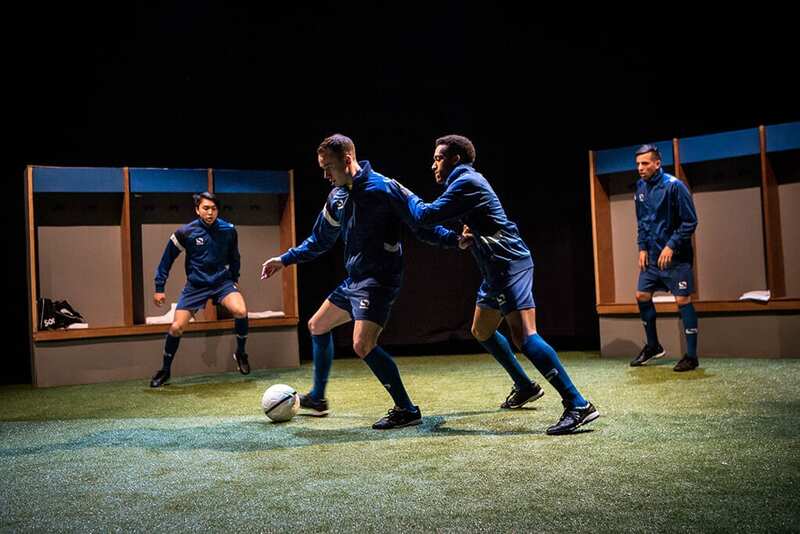 This short match-length play (45 minutes each half), explores the pressures undergone by a group of young footballers at a youth training academy. Their ultimate goal is to secure a contract by the end of the training process, but all are aware that only a few will be selected. Isolated as a group away from the everyday (though still with those issues in the background), living and breathing football, they are introduced to Mark (Richard James-Clarke) , a sports psychologist brought in for what initially is a box-ticking exercise, to try and assist them with improved performance and support strategies. Meeting open resistance from tough-nut coach Carl (played with gleeful relish by Cameron Jack) and the players themselves, who ensure that his group sessions degenerate into farce with their fast-paced banter, lobbed put-downs and general disinterest, Mark is left trying to fight his corner alone. The main emphasis of the play is on how these individuals fit into the tough regimes of the group, and the assimilation (or lack of) of outside influences. 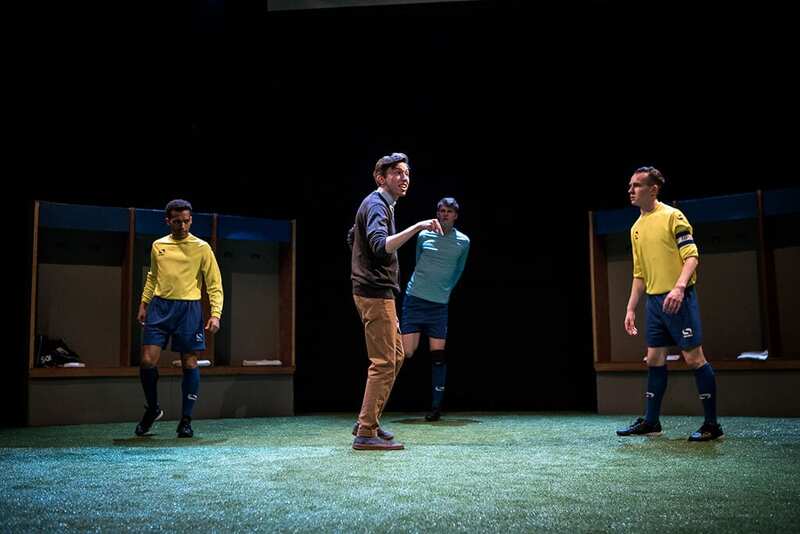 We see how the players function as part of a collective, and how their various personalities need to be subsumed into the whole, for the benefit of the team, with coach Carl acting as a sort of geezer-ish Gunnery Sergeant Hartman (from ‘Full Metal Jacket’). This brief, intense period, where you cannot let your comrades down, and which could ultimately alter the course of your life forever (not least in terms of the astronomical weekly wage which could result from success) cannot however annihilate individual worries and, of course, the members of the unit are also in competition with each other in this boot camp. So we hear of the troubled upbringing of goal keeper Titch (Joel Phillimore), failed anger management of Ashley (Zephyn Taite) – more of an immediate problem as it gets him in trouble on the pitch – and witness the cultural and linguistic barriers afflicting Japanese newcomer to the side (Ichiro – Jules Chan), ignored by the others, and the ‘devil may care’ cockiness of Stokey (Paul Adeyefay, who is possibly burying ignored insecurities below the bravado). Mark is an endearing character, tweedy and gauche, clearly wanting the best for the boys (whose lives, he is self-aware enough to realize, are far more difficult than his own). The entrance of a psychologist/therapist into the tough, macho, ‘make or break’ world of high performance industries which wouldn’t normally have given them the time of day has been explored before in drama and documentary (thinking in particular of the hilarious ‘when worlds collide’ ‘Some Kind of Monster’ about rock band Metallica). But we are also reminded of well-known incidences of suicide, problem drinking and risky behaviour which have beset talented young sportsmen, and most commonly the devastating fear of failure (often linked to injury) besetting them at each stage and potentially ending their careers. Mark’s initial bond with the injured David (Leon Tennant) comes when he gives him a newspaper article which highlights how he helped another sportsman face his fears, and shows how the stigma of asking for help is being addressed proactively by sporting associations. 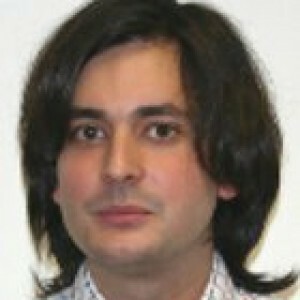 Although how he actually manages to reach the boys as a whole and win some of them over is not really shown onstage, Mark does eventually gain his longed-for, more useful one-to-one sessions (where the can have a space away from the group – ‘Getting Mark-ed’ as Carl proudly terms it) and he can attempt to prepare them for the inevitable fallout to the eventual selection process. Unfortunately, with such a compacted timeline and the number of team members involved it is inevitable that some individuals take precedence in the story while others remain in the background (like the varying forces of personality within any group of adolescents). In addition there is a danger that the characters can turn into mouth pieces for certain key themes, representations of types, due to the short length and number of issues explored. 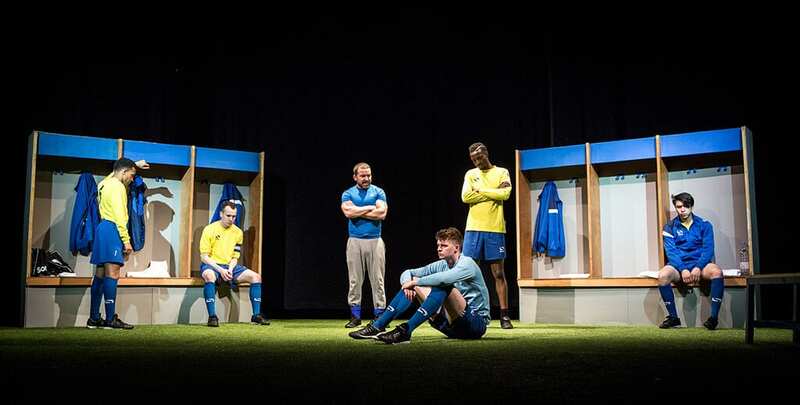 But the play’s length did in fact work to its advantage in some respects, highlighting the required short-term intense interaction of such a group (and a football team), whilst the sensitivity of the writing and the touching, endearing portrayals by the actors gave us little glimpses of the complexities involved, pointing to the difficulties Mark would have at getting any deeper into their psyches. 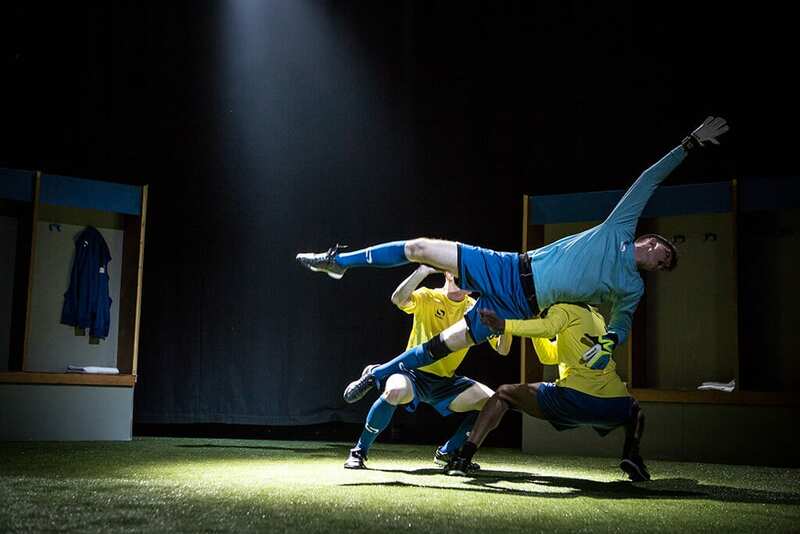 Final and highest praise though should go to the physical staging of the play, and the athletic dexterity of the actors shown through their constant workouts, expert ball tricks, and the extremely impressive use of slow motion which freezes the action of the matches while a particular character is spot-lit in the foreground. The setting also gave us the pitch-perfect atmosphere of a floodlit field on, say, a wet winter Tuesday evening, with all the normalcy and drama it can contain.